The perfect introduction to Namibia: desert, coast and safari. 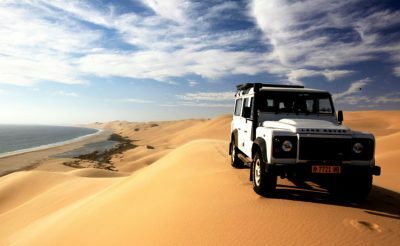 Spend 12 days exploring this superb self-drive destination on an unforgettable journey to the Namib Desert, Swakopmund, Damaraland and Etosha National Park, with an opportunity to visit AfriCat's Okonjima reserve. All the major highlights of Namibia are wrapped up in this fabulous self-drive holiday – ideal for first-timers or those who want to experience a little bit of everything. You’ll drive into the heart of the Namib Desert along a spectacular avenue of giant dunes leading to the fabled clay-pan of Sossusvlei. You’ll spend time at Swakopmund – Namibia’s adventure capital – with a chance to go kayaking with seals or fat-biking in the desert. Then Damaraland beckons. 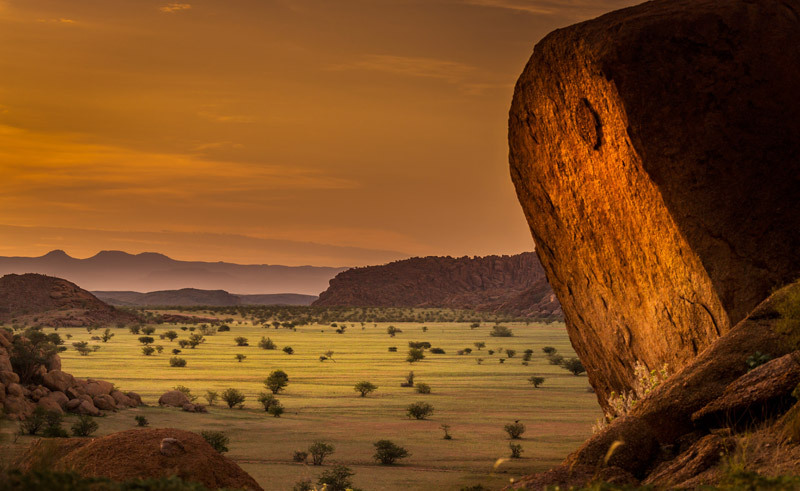 The scenery here is breathtaking: vast rocky plains and rust-red mountains… and it’s also a treasure chest of ancient rock art and a stronghold for rare desert-adapted elephant and black rhino. Further north lies Etosha National Park which you’ll traverse – west to east – stopping to view zebra, giraffe, elephant, springbok and other wildlife. 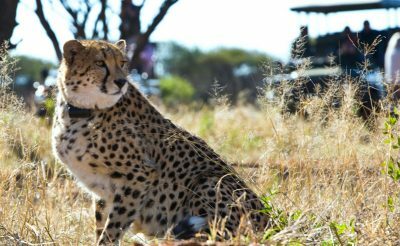 Returning south to Windhoek, you have an opportunity to visit Okonjima, where you can find out about the work of the AfriCat Foundation to protect Namibia’s cheetah, leopard and other big cats. Namibia really blew us away, the people, wildlife and landscapes were amazing. The car itself was great, very very glad we got a 4x4 though! Airfares start from around £700 per person and are quoted separately to the holiday price. When enquiring, our Travel Specialists will provide the best fare possible from your preferred airline / airport. Arrive at Hosea Kutako (Windhoek International) Airport, where you will collect your rental vehicle and drive into Windhoek, the capital city of Namibia. After checking-in at your accommodation, you are free to relax or explore the city. Windhoek is a city of many contrasts; modern skyscrapers blend with historic buildings from the German colonial era. Windhoek attractions you may wish to explore this afternoon include the Christ Church (Christuskirche), the capital’s best-recognised landmark, the National Museum of Namibia which houses an excellent display on Namibia’s independence and Katutura, a former apartheid-era black township. Windhoek has a selection of restaurants from which to choose, and Joe’s Beerhouse is a Windhoek institution. 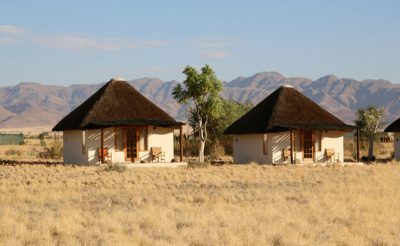 Leave Windhoek and head south through the mountains of the Khomas Hochland into the low plains of the Namib Desert to a lodge in the Sossusvlei area, from where you will have excellent opportunities to explore the oldest desert in the world. The Namib Desert is commonly referred to as the world’s oldest desert, dating back at least 55 million years. The desert is a large expanse of moving gravel plains and dunes of all shapes and sizes. Part of the desert, towards the centre incorporates the Namib-Naukluft National Park, which is the largest park in Namibia (50,000 square kilometres) and the third largest in Africa. The Namib Desert is largely unpopulated so there is no light pollution making it one of the best places in the world to stargaze. In 2013 a large part of the desert became a UNESCO World Heritage Site under the name of ‘Namib Sand Sea’. Today is free to explore Sossusvlei and Sesriem Canyon. The best time to visit Sossusvlei is close to sunrise, avoiding the heat of the midday sun and taking advantage of the natural light to bring out the best of the strong and constantly changing colours of the dunes - warm tints of apricot, orange, red and maroon, which provide excellent photographic opportunities. Sossusvlei itself is a large, white, salt and clay pan. 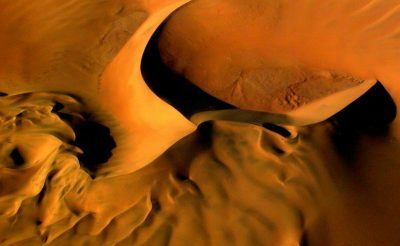 However, the name ‘Sossusvlei’ is often used in an extended meaning to refer to the surrounding area, including Deadvlei and other neighbouring rust-coloured sand dunes. A climb up the dunes is rewarded by spectacular views and is highly recommended. 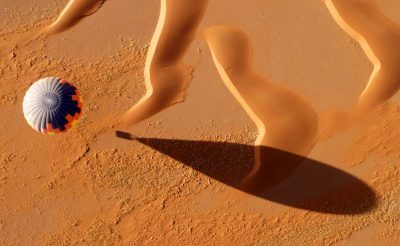 The most popular dunes to walk up are Dune 45 (80m), one of Sossusvlei’s most iconic dunes, and Big Daddy which at 325m is the highest dune in the area, boasting great views of Deadvlei. Close to Sossusvlei, Deadvlei is a clay pan characterised by dark, dead camel thorn trees which stand in stark contrast against the white pan floor. This afternoon you may wish to visit Sesriem Canyon. Shaped by the Tsauchab River over millions of years, it is one of the few places in the region that holds water all year round. The canyon is 30 metres deep in places and only three kilometres long. You can explore the canyon on foot, admiring its stunning rock formations and cooling off in some of its refreshing pools along the way. Before leaving the Sossusvlei area this morning, you may wish to partake in a sunrise hot air balloon ride over this magical landscape; an unforgettable experience. Leaving the Sossusvlei area, you will drive north to Swakopmund, perhaps stopping off at Solitaire en route to taste some of the famous apple pie on sale there. Swakopmund is a German colonial town located on the Atlantic Coast and encompassed by the Namib Desert. This is Namibia’s most popular seaside town and the beaches are pleasant; however the water is normally too cold for swimming. 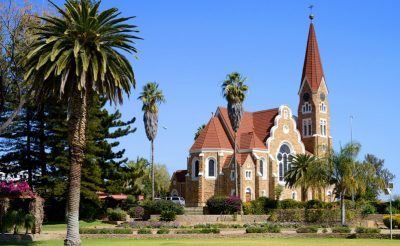 Swakopmund is a pleasant town to wander around and take in its German architecture and colonial history. It is also renowned for its excellent seafood which you may wish to sample tonight, The Tug restaurant is a particular favourite of ours. From Swakopmund, there are several excellent activity options, taking advantage of either its marine wildlife or the surrounding desert. 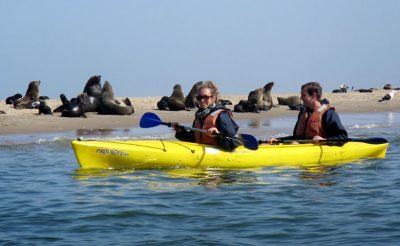 Kayaking is a fantastic way to experience the marine wildlife up close and personal including Cape fur seals in their thousands, bottlenose and Haviside’s dolphins, pelicans and flamingos. If you are lucky, you may also spot whales, leatherback turtles and sunfish. 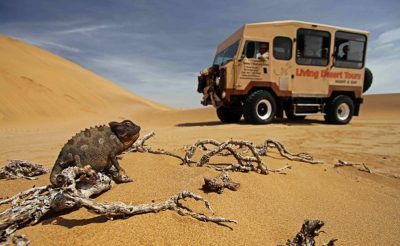 Explore the Namib Desert by 4WD or by fat bike and uncover hidden life under the sand, or take a self-drive in search of some of the country’s oldest welwitschia plants. You may also wish to discover the nearby Walvis Bay Lagoon, the most important wetland in Southern Africa, with 170,000 resident birds around the lagoon and some 200,000 more stopping off on migratory routes. The lagoon is the feeding site for around 80% of all the lesser flamingos found in Southern Africa and about 50% of greater flamingos. It also attracts large numbers of chestnut plovers, pelicans, Caspian, Damara, and swift terns, white-fronted plovers and Hartlaub's gulls. 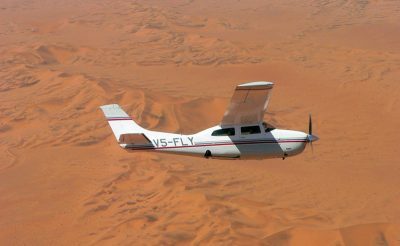 Depart Swakopmund along the Atlantic Coast towards the north, heading to Damaraland. One of the most scenically beautiful regions in Namibia, Damaraland is also the best place in the country to see animals completely unfenced and in the wild. You will not see animals in large quantities here, but the sightings can be more rewarding. Desert adapted elephants are probably the best known of the region’s unique wildlife but it is also possible to see desert adapted rhino, giraffe and lion in this area too. 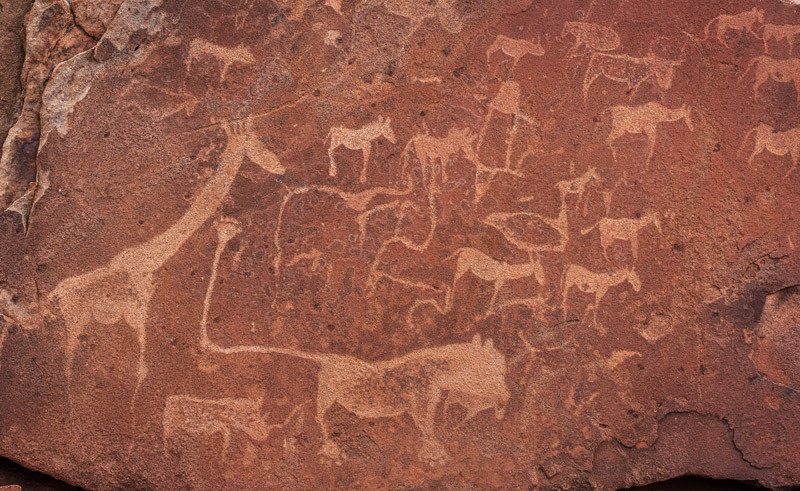 Damaraland is also home to many interesting geological formations and some of the best examples of bushman paintings and engravings in Southern Africa. Today is at leisure to explore the local area. Searching for desert adapted elephants is a highlight in this region. 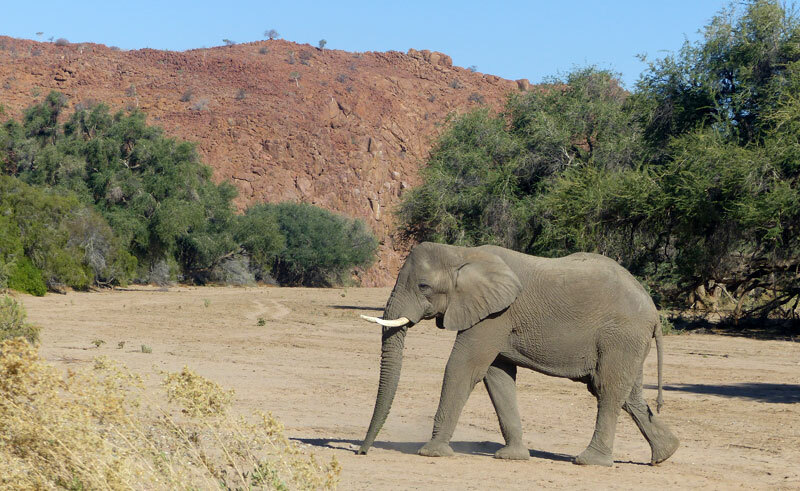 Namibia is one of only two countries in the world where you can find desert adapted elephants (the other is Mali). They are not categorised as a separate species but they are special because they have evolved to thrive in the dry, semi-desert environment by having a smaller body mass with proportionally longer legs and seemingly larger feet than other elephants. Their physical attributes allow them to cross miles of sand dunes to reach food and water. Nobody knows how many desert dwelling elephants there are in Namibia, but estimates are between 100 and 600. This afternoon, you may wish to visit the rock art at Twyfelfontein. Namibia’s first UNESCO World Heritage Site, Twyfelfontein features 2,500 examples of bushman paintings and engravings dating back 6,000 years. The rock engravings are found on a number of smooth rock surfaces and most of them depict animals and their tracks. It is recommended that you explore the site with a knowledgeable guide. 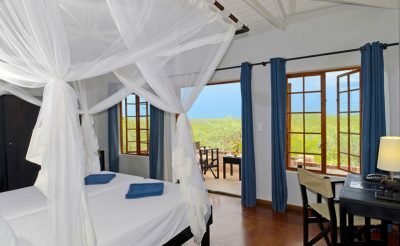 Today you head via Kamanjab to the southern entrance of the Etosha National Park where you will stay tonight. 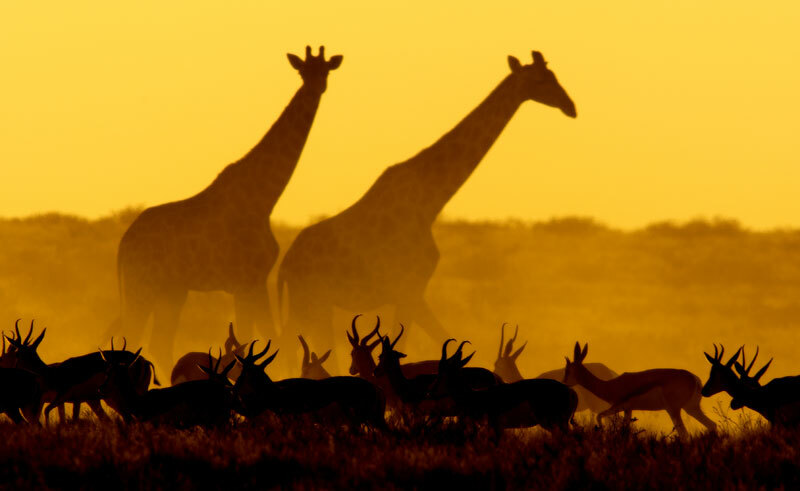 The wildlife jewel of Namibia, Etosha National Park is one of the best game reserves in Africa. Etosha is huge; at 22,270 square kilometres it covers an area larger than Wales and is home to over 100 species of mammals, 110 reptile species, 16 amphibians and 1 species of fish! Today you will enter Etosha National Park through Andersson’s Gate and drive in search of wildlife as you make your way towards the eastern exit. Etosha is dominated by a huge mineral pan, which covers a quarter of the park and was once a lake the size of Holland. Surrounding the pan is a variety of grass and woodlands amongst which live a wonderful variety of animals, birds, insects and reptiles. Etosha’s highlight is its waterholes; there are dozens of them, some natural while others are artificially fed from boreholes. During the dry season, staking out a position at a waterhole viewpoint is a rewarding way to watch game without moving from one spot. The most numerous antelope species in Etosha is springbok, which can sometimes be seen herding in their thousands. Other common herbivores are giraffe, zebra, eland, wildebeest, kudu and oryx. Black rhinos are more rare but still regularly sighted. Herds of fifty elephants are not unusual and often walk right down the middle of the road giving people in cars an incredibly close and thrilling encounter. When it comes to predators, lion, of which there are thought to be over 1000 inside the reserve, are the most visible. For birders there is a large variety of birds including ground hornbill, lilac-breasted roller, eagles and vultures. Exit the park before sunset at the Von Lindequist Gate in the east and spend the night on the Onguma Private Reserve where you can watch animals congregating at the waterhole located just in front of camp as you enjoy a sundowner drink. Today you have time to explore Etosha National Park further, perhaps focusing on its eastern fringes. Alternatively join an optional game drive on Onguma Private Reserve. Leave Etosha behind and head south to Otjiwarongo - the perfect location from which to plan an optional visit to the AfriCat Foundation. This non-profit organisation was founded in the early 1990s with the aim of securing the long-term survival of Namibia’s predators in their natural habitat. AfriCat has saved more than 1,000 predators since its inception and over 80 percent of them have been released back into the wild. The organisation is best known for its cheetah conservation programme, but it also works to protect leopards, lions, hyenas and wild dogs. On a day visit (optional), you can view some of the animals in its Carnivore Care Centre. Highly recommended is upgrading to an overnight stay at either Okonjima Plains or Bush Camp, which will also enable you to join game drives tracking the animals that are being rehabilitated in the 200 square kilometre Okonjima Nature Reserve. As enthusiastic supporters of the AfriCat Foundation, we are proud to have adopted Dune, one of its cheetahs. 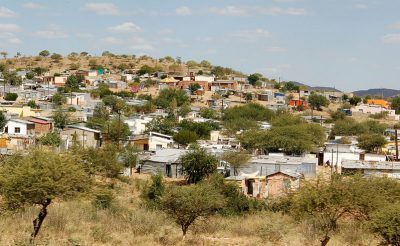 Continuing south, return to Windhoek where your adventure ends. The Cornerstone is a small, peaceful guesthouse, located a short walk from the seafront and the town centre with its many shops and restaurants. 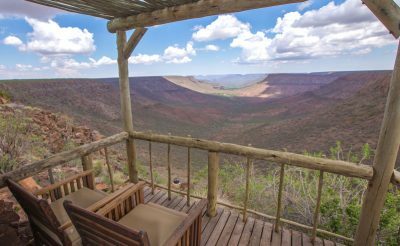 Located 30km south-east of Sesriem, Desert Homestead Lodge can be used as a base to explore Sossusvlei and Sesriem Canyon. Etosha Safari Lodge is set on a hillock only nine kilometres away from the Andersson Gate entrance into Etosha National Park and affords magnificent views of the African bush savannah. 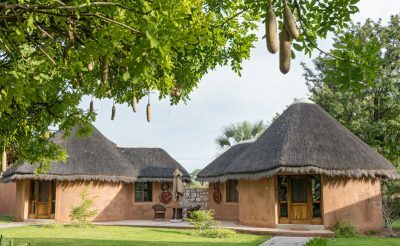 Frans Indongo is situated in the heart of a 17,000 hectare farm in the bush savannah and is modelled on traditional Ovambo homesteads. 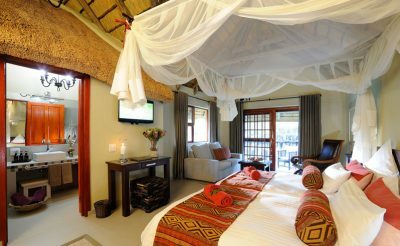 Grootberg Lodge is perched on the rim of the Etendeka Plateau, with stunning views overlooking the Klip River Valley. 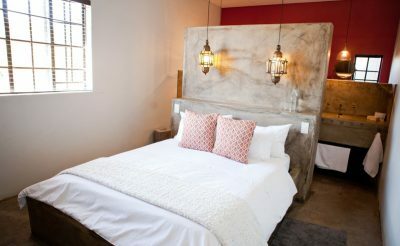 This intimate guesthouse features eleven rooms, all with air conditioning and Moroccan decorative touches. 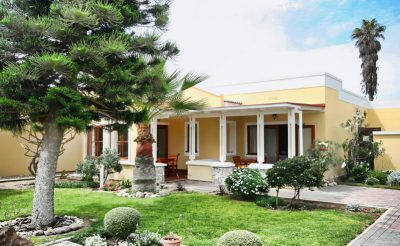 All rooms have a mini-bar, tea and coffee making facilities and a large veranda. Onguma Game Reserve is situated on the eastern side of Etosha, bordering the Fisher’s pan and a short drive from the von Lindequist Gate. Enjoy close encounters with cheetahs and other big cats at the AfriCat Foundation. 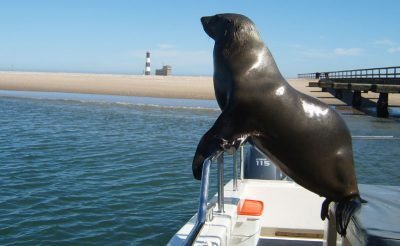 Discover Namibia’s rich marine life on a wildlife cruise to the remote Pelican Point Peninsula, home to a large Cape fur seal colony. Discover the highlights of Namibia’s capital city, Windhoek. 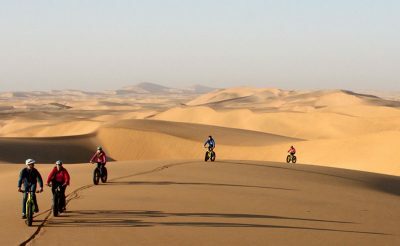 Experience the breathtaking scenery of the oldest desert in the world, riding up and along the top of Namibia’s famous dunes. This comprehensive itinerary connects all the highlights on a spectacular 17-day self drive. With its welcoming people, spectacular wildlife and mind-blowing scenery, Namibia is a truly outstanding destination. Discover Namibia’s main highlights on a small-group escorted tour taking in Etosha, Sossusvlei and Damaraland. Discover the Wonders of Namibia on a small group escorted tour, including its spectacular landscapes, fascinating wildlife and interesting people.